"New Arrivals" and get 25% OFF any item from Tea Collection, Zutano, Hub Cap and Pazitos, or visit the "Dress them Up" department for savings up to 50% OFF. ...Want more? Sure, you do!! 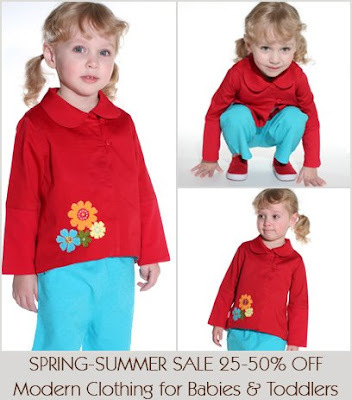 Chittypulga is offering the following coupon code SPRINGFUN, so you can get an extra 10% OFF on your order of $100 or more. Good till this Sunday, May 8th at midnight EST... So, hurry up and don't miss the goodies!! Heeeeyy!! and while you are shopping for your mini-me, don't forget Mother's Day is coming up!! Catch two birds in one shot and get that present for the expectant mom, sister, best friend or even yourself. Chittypulga has gathered a small selection of shower gifts for the modern Mom-to-Be. Diaper bags and changing kits from Fleurville, MamaMio wonderful pregnancy care products, photo albums and frames from Molly West, baby organizers and...well, why don't you click and see for yourself? Save up to 40% OFF...Grrreat!! One more goodie!! Ground Shipping is FREE when you fill up your basket with $100 worth of merchandise.... And if you have never been to Chittypulga, head over and join our e-mail list to get an e-coupon for $10 OFF of your first purchase.